Police stopped the black GMC Envoy as part of a shoplifting investigation in North Windham, before officers found materials consistent with methamphetamine production. A Limington woman was arrested on felony drug charges after Windham police and the Maine drug enforcement officers discovered a one-pot mobile meth lab during a traffic stop along Route 302 Thursday morning. Maine Drug Enforcement Agency Cmdr. Scott Pelletier, right, talks with Windham firefighters at the site where police discovered a suspected meth lab. Cmdr. Scott Pelletier of the Maine Drug Enforcement Agency said local police were alerted after a loss prevention worker at the Windham Hannaford supermarket saw four people allegedly stealing camp fuel and lithium batteries, which can be used to manufacture methamphetamine – a powerful, highly addictive stimulant that affects the central nervous system. One member of the group legally purchased Sudafed, which contains pseudoephedrine – another meth ingredient, according to the National Institute on Drug Abuse. 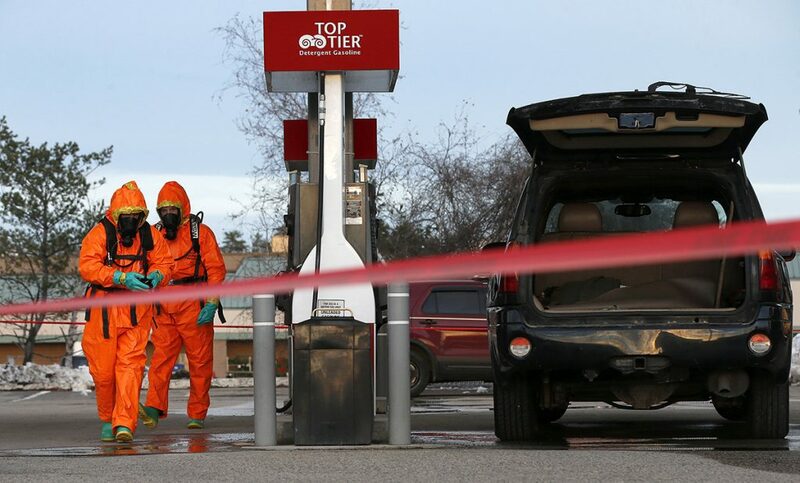 Officers stopped the group’s black GMC Envoy at the Citgo gas station at 809 Roosevelt Trail – Route 302 – around 11:40 a.m., near the Hannaford. Windham police Sgt. Peter Fulton said officers realized there were items in the vehicle that indicated meth was being manufactured. 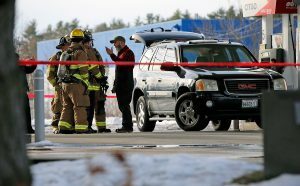 The MDEA was notified and sent specialists to Windham. Fulton said the MDEA the team spent most of the day at the scene until all the chemicals were safely disposed of. Ashley Norton, 28, of Limington was charged with unlawful operation of a methamphetamine laboratory, a Class B offense, according to Pelletier. Norton was being held Thursday evening at the Cumberland County Jail. She was being held without bail because she violated bail conditions on a previous charge, Pelletier said. Norton was among seven charged in August with criminal conspiracy in connection with a meth lab operating at a home in Hollis. Two others in the SUV were let go, but could face charges in the future. Police said a fourth person, whose image was captured on surveillance cameras at Hannaford, remains at large. Pelletier said authorities are familiar with the man. Chemicals used to make meth are highly volatile, which is why the state’s meth lab team must wear protective gear. Mobile meth labs have become more common, though many clandestine labs are located in residential homes and apartment buildings, according to Pelletier. Thursday’s drug bust in Windham was the 51st meth lab Maine authorities have encountered this year. A man was arrested and another meth lab was dismantled Wednesday at a home in Bucksport, police said.